Only a few days remain to walk past L&M’s Kitchen and Salumeria and wonder what the “BLAH BLAH BLAH” artwork located just inside really means. A favorite in Oxford Square dining, its doors will close at the end of the month as a result of the ongoing construction just steps away from its entrance. Avant Construction, Inc. of Water Valley, Miss. has been contracted to construct “Vieux Carrè: Oxford’s Premier Destination for Luxury Living, Shopping, and Dining.” Banners overlooking the construction claim, “Our Space, Your Dream.” Interesting that their space is only theirs because of contracting demands requiring the surrender of all adjoining property. 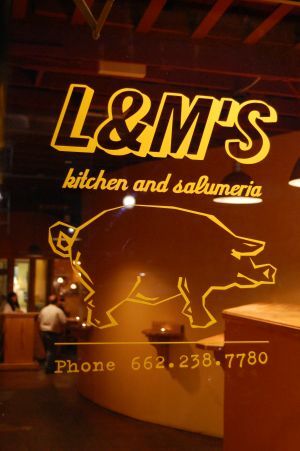 Dan Latham, owner of L&M’s, opened his Kitchen in February 2004. Latham studied in New York under Mario Batali, developing his skills as a connoisseur of Italian foods. Since then, locals and out-of-towners alike have frequented the restaurant. The Italian eatery has accommodated both casual and formal dining, serving deli-style meats and cheeses to the Chef’s special, a five-course sampling of the menu. The culinary skills that Latham literally brings to the table have established him as a region-wide respected chef. The commercial real estate boom is imposing on other businesses as well. Neighboring Bouré will relocate into the newly constructed building next door when construction is completed, which is expected in October. Upon Bouré’s vacancy, another construction process will begin to erect the second “twin tower” of the complex. Fortunately, the meat of the business is the meat itself, and it’s not going anywhere. Stan’s Country Store in Batesville will continue to house the Como, Miss.-raised sausage and pork while Oxford’s Farmer’s Market on Old Hwy. 7 will also carry the L&M famous meat products. L&M’s Kitchen and Salumeria will serve one last round of its infamous brunch as Sunday, June 29th marks the last day of business. Just goes to show you how quickly things change, I essentially lived (and quasi-lived) in Oxford during the greater part of the nineties and earliest 2000s, and have never even heard of this place! I am so unfamiliar with post 2k Oxford (which is why this website is nice)!